Description: Excellent jalapeno flavor for your favorite dipper! Ummmm! 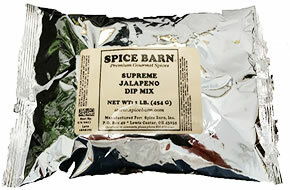 Usage: Blend 2 tablespoons seasoning per 3/4 cup of sour cream and 1/2 cup mayonnaise, or to taste. Refrigerate for at least 1 hour to blend flavors. Ingredients: Salt, Dehydrated Jalapeno, Maltodextrin, Onion and Garlic Powder, Natural Flavors including Jalapeno (Maltodextrin, Modified Food Starch, Salt, Flavor), Tomato Powder, Dehydrated Bell Peppers, Spices, Dehydrated Parsley, Less than 2% Silicon Dioxide added to prevent caking.